You'll be able to read many obituaries and assessments of Smyslov's life, chess, and indeed musicianship ( for example here at the Guardian [with the sad note that "Smyslov and his wife of more than half a century spent their final few years in near-poverty as his heart ailment deteriorated"] ) but on my part I wanted to show his recent contribution to my chess development. Not, of course a personal contribution, that would be too remarkable, but rather his contribution to the King's Indian. In my attempts to play the King's Indian as my defence to 1.d4, I have been met a few times with an early Bg5 from White. Not an immediate 2.Bg5, which is a distinct Trompovsky attempt, but a few moves later. I originally thought that this was an attempt to step out of book, but no, it is a specific variation, developed by, and named after Vassily Smyslov. Here is the main position, after the moves 1d4 Nf6 2.c4 g6 3.Nc3 Bg7 4Nf3 0-0 or d6 5.Bg5. I always continued in standard fashion with the idea to play the thematic, and eventual e5, but this turns out not to be the best way of playing against it. What to play then ? The answer is simple. When playing against the Smyslov Variation as Black, do as the great man did himself, and play the Smyslov Defence ! 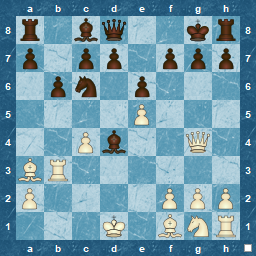 This involves not forcing e5, but rather playing an early c5 ( which is a standard move in the King's Indian, just not the way I play it ) and then Bf5. 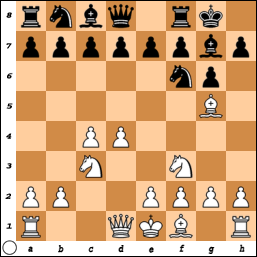 This allows Black to play Ne4, and also covers b1 and on many occasions allows an attack versus the b2-pawn. Since this is a recent discovery for me (thanks to "Starting Out: King's Indian" and Joe Gallagher), I have only played this once. A loss, but more on account of my ineptitude and lack of skill, than anything else. As in much of chess knowledge, the Master presents the ideas and we attempt to interpret and execute them successfully. Anyway, presented below are two games. The first is from the Donner Memorial Tournament in 1994 with Smyslov as Black playing his own defence against his own invention ! Naturally, he wins. 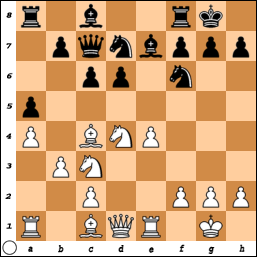 The other is an example from 2001 of Black trying to force e5, White meeting it with Rd1, and eventually winning. It was decided by two blunders by Black, and by move 15 was over, Black being a Rook and knight down, but he played on. It was a simple threat of mate that lost him his Queen two moves later, and he then spent 40 minutes thinking of the remaining moves (20 on the last two ). Not a lot to say about it, but it hardly challenged me, and I guess he must have had a very off day ! Interesting points around moves 7 - 10. At what point do you exchange the c6 knight ? I think I was almost too late on move 9, but not sure what sort of guidelines there are for it. ( See Anonymous comment). Still 1,5 points so far in the tournament so it can't be bad ! Another game from De Vere, another Philidor, but a different variation (4.Qxd4 ). This is known as Morphy's variation as it was his preferred way of playing against the Philidor. Alekhine also used this method. The stronger move is probably 4. 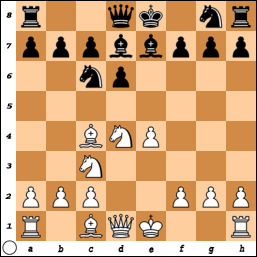 Nxe4, but the Queen-capture avoids the reply 4...g6 ( Larsen's Variation), so has its benefits. De Vere's opponent here is the GA MacDonnell, who, as well as being a Reverend and chess player, seems to have become well-acquainted with de Vere travelling with him to many tournaments, and even writing about him is his “Chess Life-pictures” book. This game was part of the inaugural British Chess Association Challenge Cup The winner was to be declared British Champion and De Vere accomplished this in style, not losing a single game. I'm reading a book about Cecil de Vere ( 1845 -1875 ) , a 19th Century English chess player dubbed "The Young Morphy" by Steinitz. Little is known about him ( so a relatively slim book ) but he seems to have been a talented chess player, although inclined to indolence, and unwilling to put the effort into fulfilling his ability. He died young, of consumption, but left a legacy of fine games, as well as good memories ( judging by the obituaries reproduced in the book ) to many of his contemporaries. 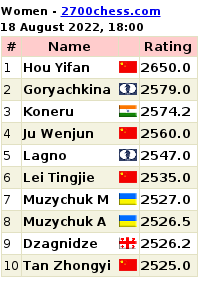 He played in few International tournaments, Baden-Baden 1870 being one, but had decent results against strong players such as Steinitz, Blackburne and Zukertort. "Man is not a final and defined quantity upon which firm calculations can be made; man is free, and can therefore violate any regulating norms that might be thrust upon him"